Fresh homemade sticky buns oozing with sticky stuff, pecans and raisins - put it in overdrive baby - these are gonna blow you away!! Flour tortilla topped with lots more cheeze, scallions, tomatoes, eggz and your choice of 1 piece of: bacon, ham or sausage. 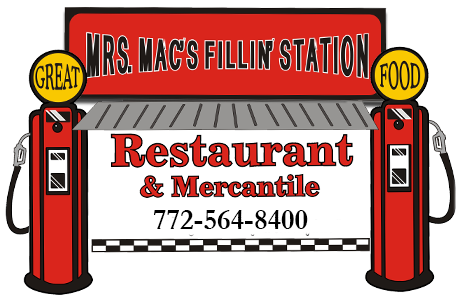 Three fresh eggz with all the fillin's served with Mrs. Mac's home fries or grits and toast or biscuit with jam/jelly. Sauteed green peppers, tomatoes and onions with mushrooms and cheeze. Sauteed onions, roasted red peppers, fresh spinach and tomatoes with feta cheeze. Sauteed onions, green peppers, tomatoes and mushrooms with cheeze and your choice of bacon, sausage or ham. Choice of 1: ham, sausage, bacon 'n' cheeze. Sundried tomatoes, sausage, onions, tomatoes, fresh spinach and provolone cheeze. Mrs. Mac's chili and cheeze. Thin sliced choice steak with sauteed onions, green peppers 'n' cheeze. Sausage or bacon, potatoes, sauteed onions, peppers and cheeze. Sauteed onions, peppers and smoked ham. Pita bread stuffed with 2 fresh eggz, cheeze and choice of 1: bacon, ham, sausage or steak, then grilled. Sauteed onions, green peppers, tomatoes with scrambled eggz "n" smoked ham topped with cheeze on a toasted bagel. Toasted English Muffin or biscuit with 1 egg, cheeze and choice of 1: ham, bacon or sausage. Two (2) eggz scrambled with jalapenos, sausage and scallions topped with tomatoes and melted cheddar jack served on a grilled croissant. Grilled sourdough with melted provolone and cheddar cheeze, crisp bacon, scrambled eggz with spinach and sliced tomato. Taylor pork roll on a grilled Kaiser with a fried egg and American cheeze. Thomas' English Muffin topped with a poached egg, Canadian bacon, Hollandaise sauce and home fries or grits. Two eggz scrambled with ham, tomatoes, green onions and spinach over a fresh biscuit or croissant topped with hollandaise and a sprinkle of cheeze with home fries, grits or fruit. Two eggz with home fries or grits, toast or biscuit with jam or jelly with choice of 1: bacon or sausage. Choice 6 oz. steak with two eggz, home fries or grits, toast, biscuit with Knott's Berry jam or jelly. Two eggz with home fries or grits, toast or biscuit with smoked ham or corned beef hash. Country fried steak with 2 eggz, Mrs. Mac's home fries or grits, toast or biscuit with jam or jelly. Two fresh eggz, two pancakes and two pieces of bacon or sausage. Smoked ham, scrambled eggz "n" cheeze with a touch of strawberry jam served on French toast. Any Below With 2 Slices of Bacon or Sausage - $2.25 Extra! Eight silver dollar size short stacks with real butter and syrup. Three blueberry pancakes with real butter and syrup. Pancake and sausage on a stick. Mrs. Mac's Home Fries - Wow!